Is my hunky farmguy good or what? 8/7/06: Sweeping Off the Truck or Dancing with the Broom? 7/14/07: In the hay. Be back soon. Go out and dazzle someone with your brilliance this weekend! © FarmgirlFare.com, the kicked, scratched and generally beat up (when did that nasty green stuff get all over the front of my white tee shirt?) 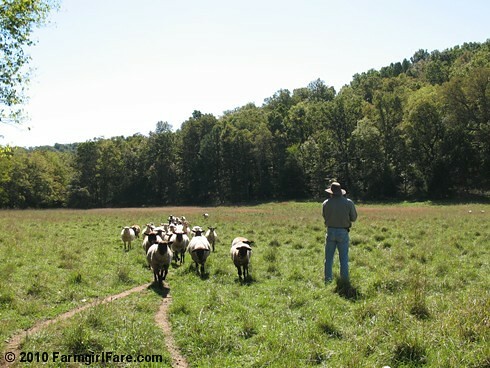 foodie farm blog where today we wrangled some sheep, and tomorrow we'll be wrangling a lot more. The easy part is getting them out of the field. The best part is being done—and musing over all the things about the day that weren't so funny at the time, but are really good for laughs (and often make great stories) once you're out of the barn and soaking away your aches and pains in a nice hot whirlpool tub. Hard work may be rewarding, but a little pampering feels really, really good. Eeeee, they're so cute! ^.^ Glad SilverBeat shared your blog over in the Etsy forums. I think running sheep are so cute. I love opening the gate and seeing the girls come running to see if any apples fell while they were out grazing. 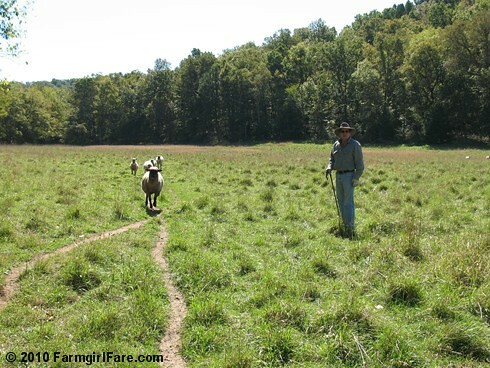 Your Hunky guy fits right in there on the farm. YES! Nice hardworking, hunky farm guy! And the sheep are pretty cute, too! I expected to see a dog in the last picture, but no! I guess girls of all kinds appreciate a hunky farm guy. Sheep, donkeys and a hunky farm guy??? You are sooo lucky! Good job getting your sheep in. Looks they are not wasting any time getting in. Wow. And I thought raspberry bushes would be a lot to take care of. 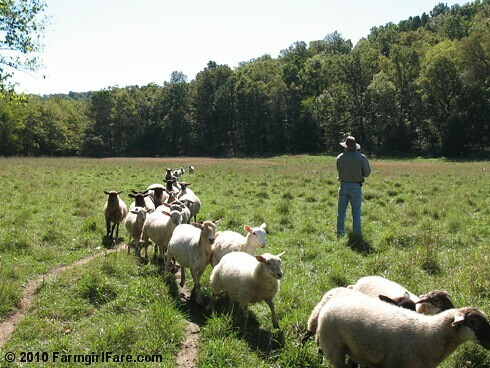 Luckily you have hunky farm guy to help you and it doesn't hurt that the sheep are cute too. I need a soak in a hot tub right now. After several hours in the saddle on saturday, everything hurts!